Figure 1. 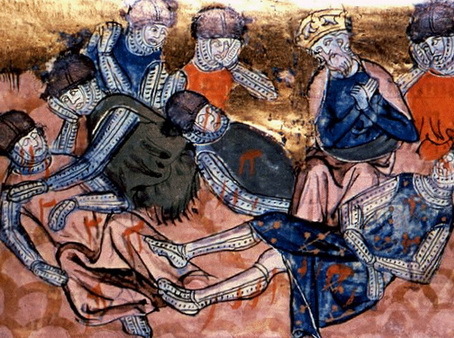 Charlemagne finds Roland dead. Wikipedia contributors. "The Song of Roland." Wikipedia, The Free Encyclopedia. Wikipedia, The Free Encyclopedia, 23 Apr. 2012. Web. 23 Apr. 2012. In The Song of Roland, after the battle ends several important things occur. Charlemagne has his men completely destroy Saragossa and its art and religious iconography (The Song of Roland 109). Not only the traitor Ganaleon but also, because the poem was written in an honor/shame society, thirty of his relatives are put to death (The Song of Roland 118). 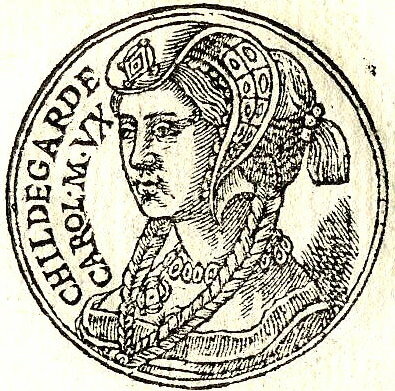 Bramimunde, the wife of the Saracen King, is baptised and renamed Julianne (The Song of Roland 119). The reader is made to feel that France is safe and that positive things are going to be happening for Charlemagne. Finally, and most importantly, however, Charlemagne is visited by the Angel Gabriel who instructs him to “summon all the force of your Empire and enter the land of Bire by the force of arms, and rescue King Vivien, for the pagans have laid siege to him in the city of Imphe, and the Christians there are pleading and crying out for you” (The Song of Roland 119). Just after losing a large force in Roncesvalles, Charlemagne is called on another campaign. The 200 year old Charlemagne replies, “my life is a burden!” and weeps after hearing this (The Song of Roland 119). After the actual Battle of Roncesvalles, very little happened, or rather, we know about very little that happened. The battle was “not even mentioned in the Royal Annals, and for shame the whole Spanish campaign was omitted, but everyone knew what had happened” (Heer 108). We do know, however, that Charlemagne was “prevented by events in Saxony from seeking revenge” and distracted at home with a famine “partly caused by the absence of so many on campaign during the harvest” (Heer 114). Charlemagne spent the next 25 years in Saxony before the campaign was finished (Lewis 262). Since “Charlemange was engaged in almost constant battle throughout his reign” nothing more ever seems to have come of the situation (Wikipedia contributors). The Song of Roland has, however, stayed popular despite the historical obscurity of its origins. Heer, Friedrich. Charlemagne and his World. New York: Macmillian Publishing Co., 1975. Print. Wikipedia contributors. “Charlemagne.” Wikipedia, The Free Encyclopedia. Wikipedia, The Free Encyclopedia, 9 Apr. 2012. Web. 23 Apr. 2012. Figure 1. Noble battle. Wikipedia contributors. "The Song of Roland." Wikipedia, The Free Encyclopedia. Wikipedia, The Free Encyclopedia, 23 Apr. 2012. Web. 23 Apr. 2012. Status is incredibly important in honor and shame societies, and that is clearly reflected throughout The Song of Roland. Though the actual Roland who participated in the Battle of Roncesvalles was the governor of the Brenton March, a fairly important position, his status is further elevated within the poem because the author chooses to make him the nephew of Charlemagne (Wikipedia contributors, “Roland”). This noble lineage gives him a distinct place among his very honorable peers and makes him the clear choice for the main hero of the piece. Interestingly, but not surprisingly, this stratification among the noble is not only reflected in the lineages and respective social statuses of the French nobility. The same criteria apply to the enemies that each of the twelve peers face. In stanza LXIX, the nephew of King Marsiliun asks to face off against Roland, the nephew of Charlemagne (The Song of Roland 29). In LXX, he asks his uncle to select twelve barons to face the twelve peers in Roland’s entourage, again, providing a perfectly equal match (The Song of Roland 29). Interestingly, though many of the Saracens are described as being powerful and well-bred but heathen enemies, some of the descriptions are also very positive. In stanza LXXII there is “an Emir from Balasquez whose body is noble and handsome, and whose face is bold and open…renowned for his courage…if only he were a Christian he would be an excellent knight” (The Song of Roland 30). Descriptions such as these again emphasize the worthiness and status of the opponents that the French will face, giving them greater honor in their victory. During the actual battle of Roncesvalles however, the French did not fight people who matched their social standing. The Basques were fellow Christians and had been conquered for some time (Wikipedia contributors, “History of the Basque People”) Moreover, the Basques did not attack on equal footing, they surprised the French baggage train from above, killed everyone, “plundered the baggage and disappeared” (Heer 113). In fact, there is a possibility that the Basques were not even acting in retaliation for the French treatment of their cities: they may have attacked “simply for plunder” (Heer 108). Wikipedia contributors. “Roland.” Wikipedia, The Free Encyclopedia. Wikipedia, The Free Encyclopedia, 18 Apr. 2012. Web. 23 Apr. 2012. Wikipedia contributors. “History of the Basque people.” Wikipedia, The Free Encyclopedia. Wikipedia, The Free Encyclopedia, 19 Apr. 2012. Web. 23 Apr. 2012. Figure 1. Charlamagne in Baghdad. Wikipedia contributors. "Charlemagne." Wikipedia, The Free Encyclopedia. Wikipedia, The Free Encyclopedia, 9 Apr. 2012. Web. 23 Apr. 2012. 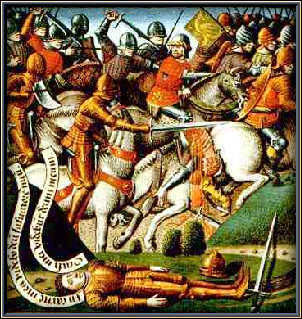 In the poem The Song of Roland, the Battle of Roncesvalles appears to have been fought strictly between Christians and Muslims in an attempt to convert and to conquer. Special emphasis is placed on the religiosity of figures on both sides of the battle to heighten the reader’s awareness of this fact. Charlemagne is a prime example. In stanza XI of the poem we are told that Charlemagne “rises in the morning, [and] hears mass and matins” (The Song of Roland 7). The endnotes in the book explain that “for a secular man to hear both mass and matins would be unusual” (The Song of Roland 125-126). Charlemagne is also connected in the poem to several biblical figures because he has visions and dreams. In stanza LVI for example, he has a dream which foreshadows Ganaleon’s betrayal (The Song of Roland 24). Charlemagne also employs Archbishop Turpin as one of the knights in his inner circle (Wikipedia contributors, “The Song of Roland”). The author of the poem places equal emphasis on the religiosity of the Saracens, but in an extremely inaccurate way, reflective of the time period that the piece was written in and the Christian writer. We are told that King Marsiliun, the leader of the Saracens, “serves Mahomet and prays to Appolin” (The Song of Roland 3). Though the poem accurately associates the Prophet Mohammad with Islam, worshipping Appolin goes directly against the first pillar of Islam which declares that Muslims serve only Allah, the God identified in the Old Testament (Wikipedia contributors, “The Five Pillars of Islam”). The Saracen’s religiosity is, however, strongly emphasized, establishing their fervor for their faith over and over again as the antithesis of the Christian religiosity of the French. The reality of the Battle of Roncesvalles was less religiously-driven and more complex. The French actually allied themselves with “the Abbissad governor of Barcelona, Suleiman” after he came to court to gain their assistance in a power struggle with a rival Muslim ruler (Heer 106). 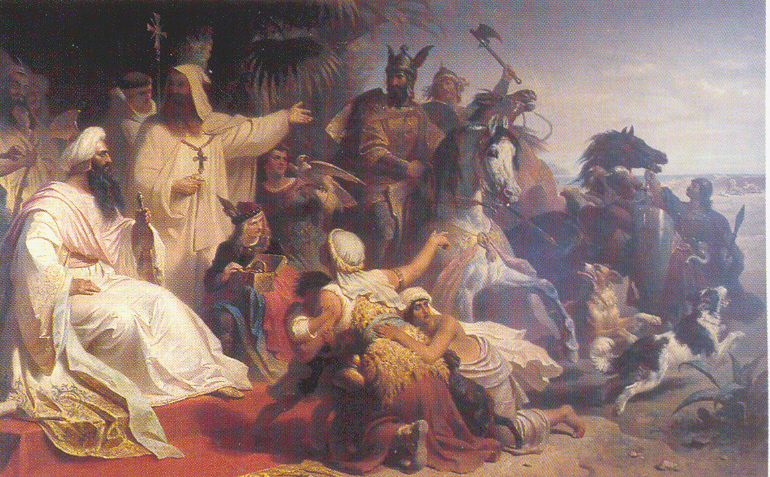 Charlemagne was offered land for his assistance and accepted. Charlemagne did, however, certainly support “enforced religious conversion,” and it may have been a factor in his decision (Lewis 242). When he approached Pampelona as he was working his way into Spain, he “found it held against him, although it was a Christian city, and had to take the place by storm” (Heers 107). This certainly conflicts with the glorious Christian unity expressed in the poem. What is more, many of the Basques in Pampelona enjoyed Muslim rule because “Muslims were on the whole much more tolerant of other religions than the Christians were” which again, conflicts with the negative portrayal of Muslim rule in the poem (Lewis 107). Wikipedia contributors. “Five Pillars of Islam.” Wikipedia, The Free Encyclopedia. Wikipedia, The Free Encyclopedia, 21 Apr. 2012. Web. 23 Apr. 2012. Wikipedia contributors. “The Song of Roland.” Wikipedia, The Free Encyclopedia. Wikipedia, The Free Encyclopedia, 23 Apr. 2012. Web. 23 Apr. 2012. In The Song of Roland,the cause of war is somewhat ambiguous. We are told in the first stanza that Charlemagne has essentially conquered Spain, but are never told why (The Song of Roland 3). We are, however, repeatedly informed that the Saracen King “[does] not love God (The Song of Roland 3). There seems to be a moral and religious superiority in the warfare that regards conquering as the right and duty of the Christian French, which is not surprising given the time period that the poem was written in. This moral superiority is further asserted because the Saracens create a deceitful plot to get Charlemagne to leave Spain, which involves an embassy promising that they will surrender, and then collaborate with a traitor, Roland’s stepfather Ganaleon, to plan a secret ambush on Charlemagne’s armies (Wikipedia contributors). These dishonorable actions are presented by the author as sufficient justification for retaliation. Figure 1. France and Spain with the Ebro River. Wikipedia contributors. 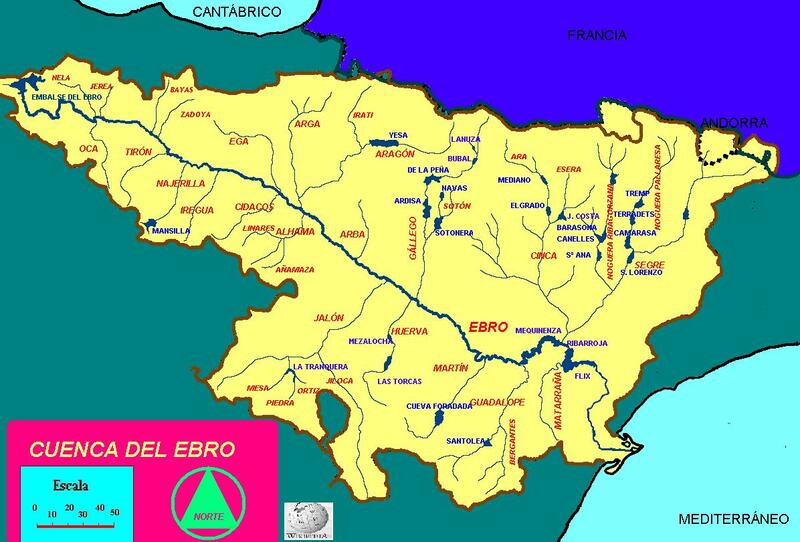 "Ebro." Wikipedia, The Free Encyclopedia. Wikipedia, The Free Encyclopedia, 17 Apr. 2012. Web. 23 Apr. 2012. Though there may have been some religious impetus for the actual Battle of Roncesvalles, other factors motivated both sides, and Charlemagne’s reasons for getting involved “are not clear” because “the campaign is not treated very fully in contemporary sources” (Heer 106). The ambiguity in the poem is, therefore, not surprising. We do know that Suleiman, the Muslim governor of Barcelona, did go to Charlemagne’s court to enlist his help against a rival Muslim ruler and that he promised Charlemagne “all of Spain up to the river Ebro” in return for his services” (see Figure 1) making the completely moral nature of the King’s motivations in the poem seem unlikely (Heer 106).The campaign was ultimately unsucessful however, and the French eventually had to return to Spain. As to the opposing side in the battle itself, the French were actually attacked at Roncesvalles by the Christian Basques because “the Franks destroyed the city [Pamplona] in an act of departing malice” on their way out of their largely unsuccessful campaign in Spain (Lewis 252). This made the Basques, who were not enthusiastic about the idea of being conquered by the Franks in any way despite their shared religion, furious, and motivated them to retaliate at Roncesvalles (Lewis 252-253). Figure 1. The Death of Roland. The actual Battle of Roncesvalles was a fairly significant military defeat for Charlemagne. Wikipedia contributors. "The Song of Roland." Wikipedia, The Free Encyclopedia. Wikipedia, The Free Encyclopedia, 23 Apr. 2012. Web. 23 Apr. 2012. As stated in the introduction, though the actual battle of Roncesvalles occurred in 778 C.E., the earliest known version of The Song of Roland, The Oxford Manuscript, was written somewhere between 1140 and 1170 C.E. (Wikipedia contributors). The time and distance between the actual event and the first written copy of the poem make it necessary to approach the historicity of the poem cautiously. One fact that confirms this need for caution is that the actual Battle of Roncesvalles was one of the biggest military missteps or disasters of Charlemagne’s career and is lionized with sufficient revenge to amend the disaster in the poem itself (The Song of Roland ix). It seems possible that the time and distance between the actual event and the first written manuscript of the poem might have made this significant historical change possible. Another reason to be alert while reading the piece is that the poem is one of the primary examples of the canson de geste literary style in France (Wikipedia contributors). These poems were written specifically to sing the praises of heroes, making it almost certain that events surrounding the hero within the poem will be shown in the best possible light. This fact is verified by clear exaggerations within the first stanza of the poem. It begins, “Charles the King, our great Emperor, has stayed seven whole years in Spain and has conquered the haughty country as far as the sea. Not a single castle resists him any longer….except Saragossa” (The Song of Roland 3). This was clearly not the case since one of the factors that persuaded Charlemagne to march down to Saragossa in the first place was the prospect of being “ceded all of Spain up to the river Ebro” (Heer 106). It is also interesting to note, when considering the influence that the canson de geste style has on the piece, that the poem has been appropriated for nationalistic purposes in both the distant and fairly recent past. The poem was “used by Pope Urban II to inspire the knights of France to join his crusade” (Heer 114), and in the 19th century, when scholars were searching for an authentic French literature, “the Chanson de Roland became the epic cornerstone of French literature, a position of popularity and dominance that it continues to occupy today” (Harrison 672). Though it is based on a fairly substantial military defeat, the triumphant tone of the poem has prevailed. The Song of Roland. Trans. W.S. Merwin. New York: Modern Library (2001). Print. 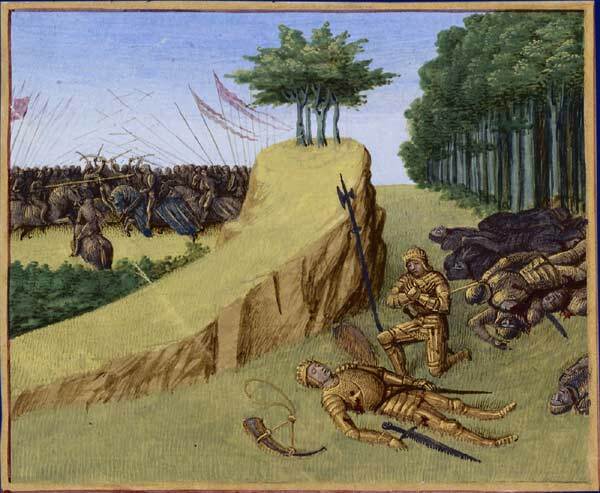 For my final project, I have chosen to do a series of blogs comparing the French epic poem The Song of Roland to the actual battle that the poem is based on: the Battle of Roncesvalles. The project will contain six blogs: one on the context that the poem was written under and possible reasons why it was written, one on the casus belli (or “cause of war”), one on religion and warfare, one on honor and shame societies, one on women and warfare, and finally one on the aftermath of the battle itself. By exploring these topics with the poem as a primary source, I hope to gain greater insight into the battle as it occurred and into the mindset of the people during the period some three hundred years later when the poem was actually recorded.